Content - ADJ Vizi CMY300s Make High School Show Choir Look Like Rock Stars! ADJ Vizi CMY300s Make High School Show Choir Look Like Rock Stars! Taking place at the beginning of the new academic year, Mars Hill Bible School’s Celebration Show Choir concert is a lavish production that runs for two hours, featuring over 50 students, more than 15 costume changes and a lighting rig to rival a Broadway show. For the 2018 performances the powerhouse of this rig was an array of eight ADJ Vizi CMY300 LED-powered moving heads supplied by long-time lighting designer Jonathan Edwards. Located in Florence, Alabama, Mars Hill Bible School was founded in 1947 and educates children from pre-school thru 12th grade, with a dual focus on spiritual and academic education. Part of a diverse arts program, the School’s Show Choir has a summer camp for rehearsals and then stages its production right at the beginning of the school year. For 2018 the show was successfully staged at the Norton Auditorium on the campus of the University of North Alabama, with Friday, Saturday and Sunday performances. Many of today’s lighting professionals started out in high school, working behind the scenes for shows and concerts. It is a great way to gain initial experience that can lead on to a rewarding career. Eighteen years ago that’s exactly how Jonathan Edwards started his journey into the lighting industry, serving as Lighting Designer for the first ever Show Choir Concert at Mars Hill Bible School during his freshman year. Having found his niche, Jonathan has been instrumental in helping to improve the production quality of the show year after year and that small-scale musical showcase, featuring just 37 students and a single costume change, has developed over the years to become the epic production it is today. And, despite graduating in 2003, Jonathan returns to his alma mater every year to design the show, now providing the lighting equipment through his company Axis Sound & Lighting. Starting out as a DJ in high school, Jonathan launched Axis in 1999 as a DJ company. However, after graduation he branched out into professional sound and lighting production, building up an inventory of equipment and roster of clients across Alabama. The company is now well-established, serving a wide variety of different events each year. Although production work is still at the heart of the business, an installation division was also launched in May of last year. Since then Axis Sound and Lighting has carried out numerous installations, both big and small, with that part of the business growing rapidly. For the Celebration Show Choir concerts Jonathan continues to act as the Lighting Designer, Programmer and Operator, while Axis Sound and Lighting also provides all of the lighting equipment as well as the set and audio system. Each year the Axis team meets with Show Choir Director JJ Davenport to agree a budget and discuss her vision for the production. They then put together a bespoke set and lighting rig to bring the technical elements of that vision to life. 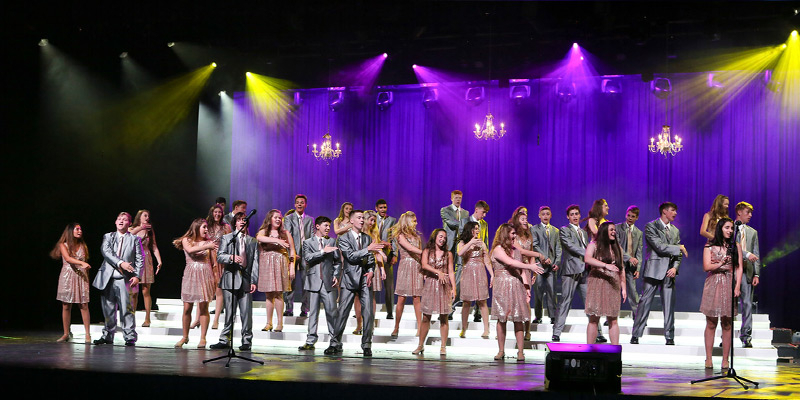 Axis Sound and Lighting added eight ADJ Vizi CMY300s to their production hire inventory over the summer and deployed them all for the 2018 Celebration Show Choir concerts. Rigged in pairs, they were positioned above and just behind the performers to allow for stage down-lighting, mid-air beams and also for creating silhouette effects. Powered by a specially-designed 300W LED engine, the Vizi CMY300 offers a massive output and expansive collection of beam-shaping tools. As a hybrid unit, it is capable of functioning interchangeably as a beam, spot or wash fixture – making it ideal for use by production companies who want to minimize inventory while maximizing the lighting looks and effects they can offer to their clients.